Take a close look at a wave-battered coast and you will discover a rich, fascinating, and remarkably brutal environment. Here, animals and plants exposed to wind, sun, and rain at low tide must cope with crashing waves as the seas rise to submerge them each day at high tide. How do living things survive in this harsh zone? 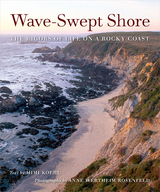 With 87 stunning color photographs and an engaging text written for those with little or no knowledge of marine biology or physics, this book tells the story of one stretch along the Pacific coast of North America—introducing the mussels, limpets, crabs, grasses, starfish, kelp, and other animals and plants that live there, and explaining how they function and flourish in an environment of waves, sand, and rocks. In pictures and words, Wave-Swept Shore explains complex phenomena, such as wave action, using simple, intuitive analogies. It explores how the forms of animals and plants affect their survival in this harsh environment, considers their distribution on the shore, and looks at their seasonal variations, focusing on what can be easily observed by visitors to the coast. Revealing the rich variety of habitats woven into what may at first look like a fairly uniform environment, the book, an effective and beautiful tool for learning about the edge of oceans everywhere, opens our eyes to the wonders of rocky shores and introduces a whole new way of looking at the natural world. Mimi Koehl,, the Virginia G. and Robert E. Gill Professor of Natural History in the Department of Intergrative Biology at the University of California, Berkeley, studies the physics of marine organisms. She is a member of the National Academy of Sciences, winner of a MacArthur Fellowship ("genius grant") and of the Borelli Award for outstanding career accomplishment in the field of biomechanics. Anne Wertheim Rosenfeld is a photographer and writer whose work has appeared in the magazines Bay Nature, Oceans, and Geo; in books by Jacques Cousteau and David Attenborough; and in numerous other texts. She is author of The Intertidal Wilderness: A Photographic Journey Through Pacific Coast Tidepools (revised edition, California, 2002). She is also a fine art photographer.